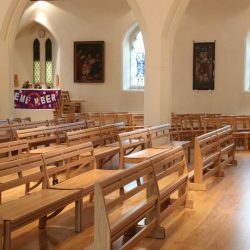 The modular Harrogate Church Bench was designed for churches that want to alter their layout without having to stack the pews. 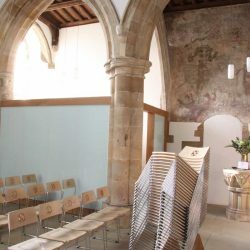 ICS first designed this innovative bench for St Mark’s Church, Harrogate. 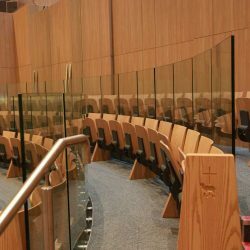 A bespoke product, it allows for total flexibility in the design for individual churches. Comfortable, practical and stylish, it has been used in nearly thirty projects to date. 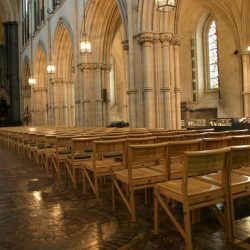 Modules of varying length enable a variety of layouts to suit each church. The upholstery panels can be easily removed to allow for new fabric. Units can be folded on top of one another. Not designed as a stacking bench. The benches are linked with dowel pins. Chair linking brackets allow a curved formation. Paneled back with engraving detail – as in St Michael’s Church, Skidby. Solid seat and back – as in St Nicholas’s Church, Hinxworth.